Electrician / Plumber – You will be thrilled, yes, thrilled, to hear, that I have a working radiator in my bathroom. My towels are warm – it’s a dream come true! All did not go smoothly. The electrician who came around initially about my wanting to install an electric fan to stop the bathroom from fogging up and causing my ceiling to flake, was also very enthusiastic about my wanting to fit a radiator. He said, “Yeah, what we’ll do is put the radiator here, and we’ll pull the pipes from the kitchen behind the bath blah blah”, thereby, giving the impression that he would fit the radiator. However, he was using the royal “we”. What he meant, was “someone else entirely”. So, I contacted someone else entirely, a plumber, and he came and fitted the radiator all ready for the electrician to come in the following day and plug it into the electrics so it can work in the summer too. The plumber came and went but the electrician cancelled a few hours before. When I’m Prime Minister, I will operate a “3 strikes and you’re taken out” policy for all tradesmen. So, in summary, I’m one small step closer to being able to let the place out. Tomorrow, I shall commence Small Step 2: sand window sills. Italian –Sonia, my Italian teacher, and I, have not been well synchronised lately and keep missing each other. However, after some weeks, we did see each other Thursday and I wasn’t too shameful. I’ve got another Italian trip to look forward to now in December – Verona – so it’s full steam ahead again with that. 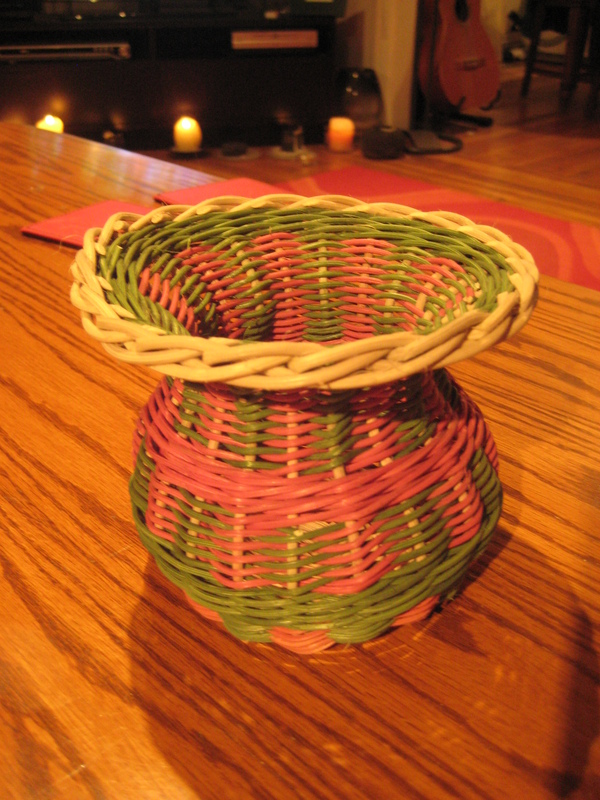 Basket Weaving – I have sad news: I don’t think I’m going to be a professional basket weaver in Italy. I’ve estimated I might be able to make 1p an hour assuming anyone actually bought my baskets. And my target buyers are just too few and far between – people that are buying joke gifts for their relatives. Sailing – In true project management fashion, I can offer you a lesson learnt: Don’t try and get crewing experience in the winter. Everyone has put their boats away. There’s a good website: www.sailingnetworks.com which you can register on for free and people can send you a message if they want your help crewing. Alas, I think this only comes into its own in the spring/summer. In the winter, it appears to act as more of a dating website. There’s another website www.crewseekers.net which presents far more glamorous crewing opportunities but you can’t see the details of until you’ve paid ££’s to become a member. Pah! I’m resigned to the fact that if I want to sail next year, I’ve more or less got to pay for crewing experience. So, “why don’t you register for the Clipper Round the World Ocean Race?” I hear you ask (yes, I hadn’t heard of it either until a friend mentioned it). Just have a guess how much it costs to go on the Clipper Round the World Yacht Race? http://www.clipperroundtheworld.com/ £53k. And you don’t even get to keep the boat. I’m not doing that. So, what’s left? Flotilla holidays where you learn, usually abroad… Sounds nice – but expensive and there’s none where you can get your RYA Day Skipper certificate it seems. OR a “sail around the UK” extravaganza –http://www.elitesailing.co.uk. I’m currently considering the latter but watch this space!